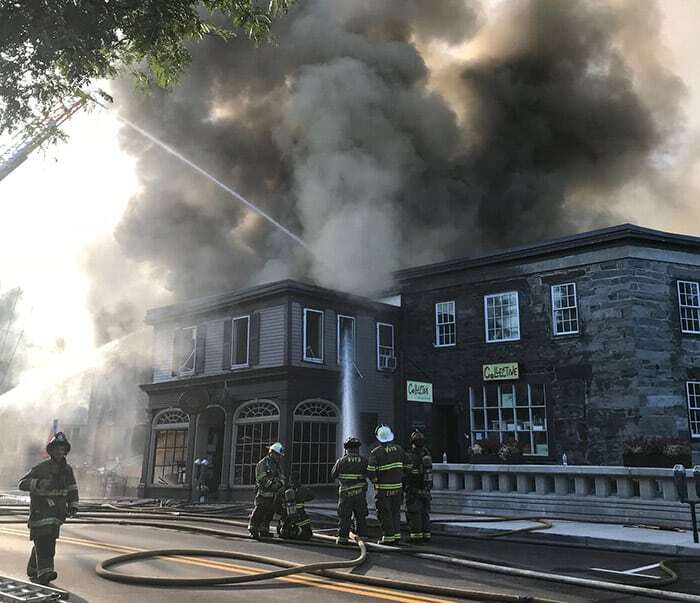 The fire started around 3:30 a.m. and damaged the historic 55 Central St. building, which housed Pi Brick Oven Trattoria, The Collective art gallery, apartments and the Vermont Standard’s offices. Two fire fighters went to the hospital from the excessive heat and humidity, said Woodstock Fire Chief David Green.The American Red Cross assisted a family that was displaced. 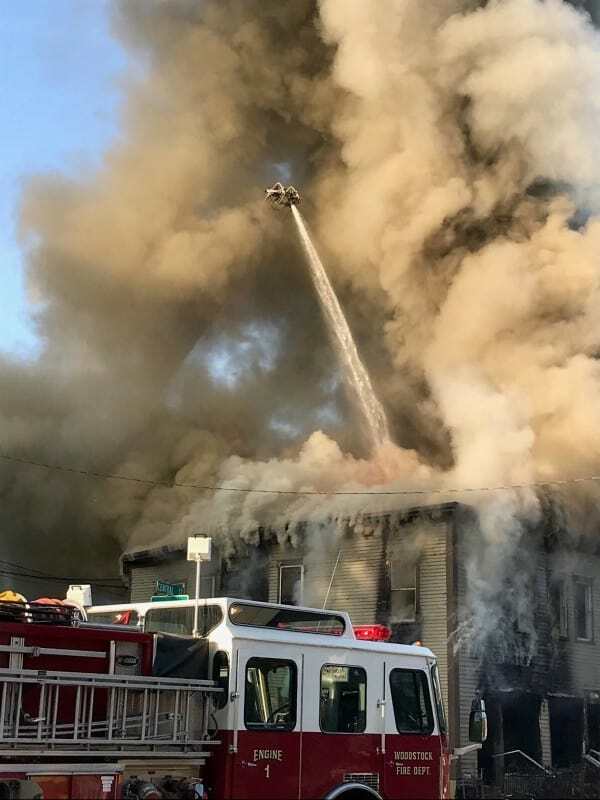 Half of the building, where the restaurant and apartment were located, was a total loss, said Ellaway Property Services, Inc. President Elizabeth Deignan. The Collective and a portion of the Vermont Standard’s offices were saved. Deignan, which manages the property, said people would be able to get back into the building and start cleaning Tuesday. “It will be a combination of demolition and clean-up, depending what side you’re on,” Deignan said. This was the second time the Vermont Standard’s offices were damaged in recent years. The former building beside the Woodstock Farmer’s Market was lost in Tropical Storm Irene in 2011. The newspaper then moved offices to Lincoln Street for about five years before moving to 55 Central St. The weekly paper, which is the oldest in the state, publishes Thursdays and has never missed a week in its 160-year history. Soulfully Good owner Vicki Ferentinos at 67 Central St., got to work around around 5:45 a.m. to bake. She saw only flames, fire and police trucks when she arrived, she said. Ferentinos baked egg sandwiches for the fire crews, she said. She said Vermont Standard employees worked there for the day to work on that week’s paper. “We manage a lot of properties and we’ve been through a lot of events but this was the first catastrophic experience —not something I want to repeat,” said Deignan. Multiple crews responded to a fire that damaged a historic Woodstock building.